Ivan Groundwater, captain of Stonehaven Golf Club, presents Sam Locke with honorary life membership. SCOTTISH amateur golf champion Sam Locke received an early Christmas present when he was awarded an honorary life membership of Stonehaven Golf Club, an honour that rounds off nicely what has been a stellar 2017 for the 18-year-old. Locke hit the headlines last August with a magnificent week’s golf at Prestwick, culminating in a superb 9 and 8 win in the final of the amateur championship, the biggest margin of victory in the match-play final since Colin Montgomerie triumphed at Nairn 30 years ago. 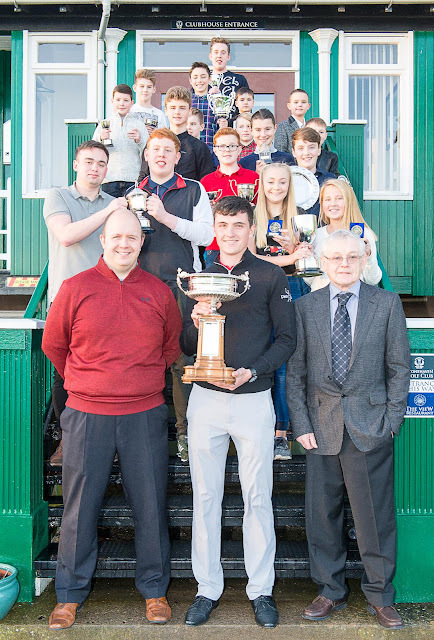 Locke’s achievement was recalled on Sunday by Ivan Groundwater, the captain of Stonehaven Golf Club, after a well-filled clubhouse watched young Sam present Stonehaven’s current crop of golfing juniors with prizes for their efforts in 2017. Mr Groundwater said that while Sam has not been a member of Stonehaven GC for long, he had strong family connections, his late grandfather Gordon Locke being a former club captain, and his father Andrew, a PGA professional at the Paul Lawrie Golf Centre, being a former club junior champion. He also lives in Stonehaven. 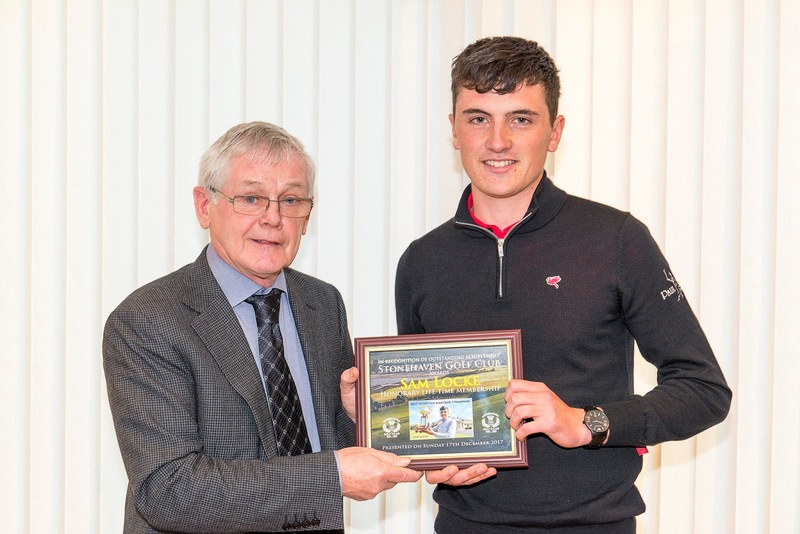 Mr Groundwater said the honorary membership was the club’s recognition of Sam’s triumph and he hoped that it would inspire new young golfers in the club to work as hard at their game as Sam had. In a question-and-answer session later, the juniors heard just how dedicated Sam was to his sport, as he told them of how he practises almost every day, often for many hours. He told them his current handicap was plus 2.4, but that he measures his game more on his world amateur ranking. Currently, that stands at 673, but his target for 2018 was to get into the top 100. His aim was to be selected for the Walker Cup in 2019 and only after that would he consider turning professional. His dream? Like most aspiring professionals, he dreamt about being world No 1, but more realistically, he aimed to be a European Tour player, to do well in Major championships, and to play in Ryder Cups. Earlier, Sam heard that junior golf in Stonehaven was undergoing a welcome revival under junior convener Chris Taylor. There were now 68 juniors in the club, including 38 new members in 2017. A new programme of 6-hole, 9-hole and 18-hole competitions proved popular throughout the season and, to mitigate costs for parents, the club was operating a cut-price club-hire scheme for new juniors. Mr Taylor said he was aiming to increase the junior membership in 2018 to nearer the 100 mark. ⚫️Earlier this year, Sam Locke was made an honorary member of Banchory GC, where he played much of his junior golf. He is also a member of the Paul Lawrie Foundation, so he will be spoiled for practice possibilities when at home. Picture caption: Sam Locke at Stonehaven Golf Club, along with his Scottish Amateur Championship Trophy. He is pictured front centre with club captain Ivan Groundwater (right) and junior convener Chris Taylor, along with prize-winning juniors.